It was a year ago, last month, that President Trump terrified California’s more than 200,000 DACA recipients with his announcement of the end to the Deferred Action of Childhood Arrivals program. While DACA remains tenuously in place today, recent ICE practices are dissuading young people from applying for renewed status. Many students are afraid or unaware that now is the time to renew their DACA status. They also may not be aware that support for doing so is available at Skyline College, that Cañada and CSM students can receive direct referrals for application assistance from their respective Dream Centers, and at all campuses free legal help is available for immigration related support. At the state level, the California Community Colleges Chancellor’s Office has begun coordinated efforts to provide leadership and training resources around undocumented student issues to all community college campuses and amped up their resources page significantly. Skyline Dream Center’s Pamela Ortiz Cerda, now a full-time program services coordinator, has been appointed to the CCCCO’s advisory committee meeting regularly in Sacramento, and will bring state resources as well as her informed activism to Skyline’s student-focused Undocu-week of Action, October 15-19 (stay tuned for more details in your email). Her experiences as an undocumented community college student herself were recently highlighted in an important New York Times article. In our District Ms. Cerda, who is a graduate student in Human Rights Education at USF, has begun sharing her leadership experience and activism as a mentor to two new Dream Center staffers, Cinthya Vierya and Paola Mora Paredes, who will begin leading task forces of staff and faculty at Cañada and CSM respectively in the coming weeks. All three young women belong to undocumented communities and are perfectly positioned to advise and support our students. Ms. Vierya, also a graduate student in education, has begun recruiting efforts for the Cañada student Dreamers Club, most club members having recently graduated, as celebrated at the District’s first annual Migration Celebration at Cañada last May. This graduation celebration will rotate among our three campuses annually. 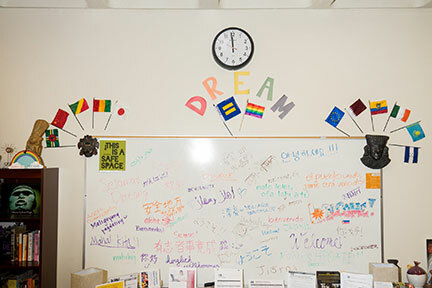 Ms. Paredes, a new graduate of UC Berkeley’s Ethnic Studies program, is making plans to bring UndocuAlly Training to CSM staff and faculty next semester, and she runs a weekly undocumented student support group on campus at the Multicultural Center. Connecting with these new staffers is an excellent way to support our students. Consider them your point of contact for information about undocumented student clubs, student events, faculty and staff task forces, becoming an ally, on-campus training and education about undocumented issues, and even monthly legislative updates. It’s our responsibility as faculty to stay aware and up to date! For more information, contact me at: silversharpj@smccd.edu. Attend a student panel & UndocuAlly Training on October 10th Flex Day and Undocu-Week of Action events beginning October 15th. Introduce yourself to Cinthya Vieyra at Canada’s Dream Center. Join the Dreamers Task Force or attend a meeting to find out how you can help. Introduce yourself to Paola Mora Paredes and join or attend a Causa Task Force meeting. Refer your students to the Undocu-Circles support and issues discussion group, Tuesdays, 3-5, Multicultural Center (Building 10-180b).